Prayer to Saint Isidore the Farmer. Dear Isidore, you know how normal it is to cultivate the land for you were employed as a farm laborer most of your life. Although you received God's help materially through Angels in the field, all farmers are aided spiritually to see the wonders God has strewn on this earth. Encourage all farmers in their labors and help them to feed many people. Amen. Isidore was a Spanish day laborer born near Madrid, about the year 1070. He died May 15, 1130 at the same place. He was in the service of a certain Juan de Vargas on a farm in the vicinity of Madrid. Every morning before going to work he was accustomed to hear a Mass at one of the churches in Madrid. One day his fellow-laborers complained to their master that Isidore was always late for work in the morning. Upon investigation, so runs the legend, the master found Isidore at prayer, while an angel was doing the plowing for him. On another occasion his master saw an angel plowing on either side of him, so that Isidore's work was equal to that of three of his fellow-laborers. Isidore is also said to have brought back to life the deceased daughter of his master and to have caused a fountain of fresh water to burst from the dry earth in order to quench the thirst of his master. 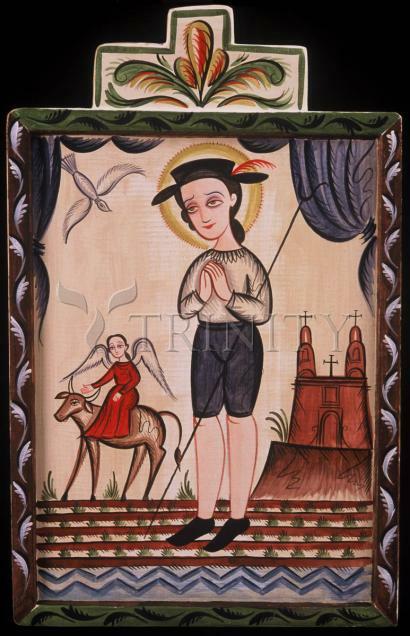 He was married to Maria Torribia, a canonized saint, who is venerated in Spain as Maria della Cabeza, from the fact that her head (cabeza) is often carried in procession especially in time of drought. They had one son, who died in his youth. On one occasion this son fell into a deep well and at the prayers of his parents the water of the well is said to have risen miraculously to the level of the ground, bringing the child with it, alive and well. Hereupon the parents made a vow of continence and lived in separate houses. Forty years after Isidore's death, his body was transferred from the cemetery to the church of St. Andrew. He is said to have appeared to Alfonso of Castile, and to have shown him the hidden path by which he surprised the Moors and gained the victory of Las Nevas de Tolosa, in 1212. When King Philip III of Spain was cured of a deadly disease by touching the relics of the saint, the king replaced the old reliquary by a costly silver one. He was canonized by Gregory XV, along with Sts. Ignatius, Francis Xavier, Teresa, and Philip Neri on March 12, 1622. St. Isidore is widely venerated as the patron of peasants and day laborers. The cities of Madrid, Leon, Saragossa, and Seville also, honor him as their patron.